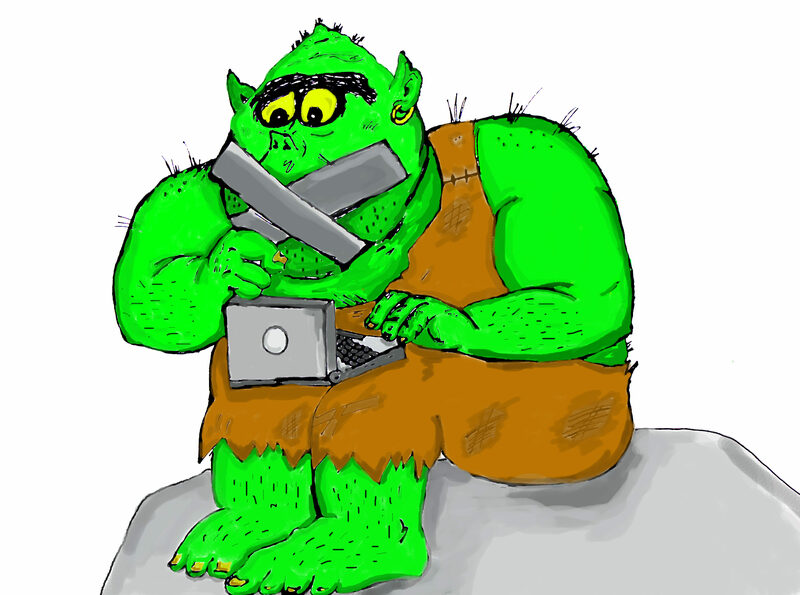 A green troll with tape over its mouth types at a computer. Esteemed veteran or accused killer? Russell Wangersky peeled away the cling wrap encasing the chicken, thinking of it sizzling on a barbecue. When he turned the bird over, he saw “a great honking fistful of still attached skin and fat” tucked in where the ribs should have been. Over six months, he investigated the meat-to-fat ratio of Newfoundland Farm Products chickens. Wangersky made several trips to the grocery store. Almost every purchase was “larded up” to increase the weight—and the price—of the chicken. His is one of many voices in the growing call to remove online comment sections. But commenters and tech experts say it’s a short-term solution to a lack of accountability and engagement from both sides of the computer screen. Popular Science axed its comment section in September 2013, stating that comments don’t belong within the realms of a science-based publication. That same month, Huffington Post did away with anonymous comments. Former managing editor Jimmy Soni cited the “online toxicity” of anonymity as an explanation. In 2014, Reuters closed comments on news stories but kept them open for opinion and blog pieces. It has no incentive to engage in criticism because its stories are “straight news,” says digital executive editor Dan Colarusso. In November, CBC closed comments on all stories about indigenous issues. In a statement on its website, it said that while providing a “democratic space” for readers is important, there had been an influx of “hate speech and personal attacks.” Claiming it didn’t want a small minority of commenters to ruin the experience for everyone, CBC will be “taking a pause” until it finds the best way to proceed. People who participate in debate to deliberately offend others are called “trolls.” Though they make up a small minority of the commenting community, trolls are the biggest catalyst of the comment section downfall. People who read negative comments below an article are more likely to view the information as less trustworthy, according to a 2013 study co-authored by Dietram Scheufele, a professor at the University of Wisconsin-Madison. The study, “The ‘Nasty Effect’: Online Incivility and Risk Perceptions of Emerging Technologies,” used a fake blog post to gauge the change in reader perception after exposure to negative comments. Several news outlets, including Popular Science, have used Scheufele’s study as justification for eliminating comment sections. Others, including Reuters and the Star, point out that reader discussion is happening on social media. Ingram says both of these reasons are simply excuses for laziness. “It requires more work to moderate, but at least the paper is exposed to points of view it might otherwise not want to listen to,” he says, adding that comment sections are a large part of building an online community, because they give readers a voice and make them feel engaged with a topic. Taking that away removes the conversation between author and audience. Leaving comments to social media isn’t any better, though. When publications hand over the conversation, they’re taking traffic away from their own articles. And, according to a Pew Research study, trolling exists regardless of the platform. So, what’s the solution? De Correspondent, a crowdfunded news site in the Netherlands, is expanding with a focus on writer-to-reader engagement. The founders, Rob Wijnberg and Ernst-Jan Pfauth, say their goal is engagement through in-depth digital storytelling. The member-based subscription publication allows only members to comment (or “contribute,” as De Correspondent calls it). It also holds live events where readers and writers can speak face-to-face. This creates a sense of real engagement and accountability. While Wangersky and others would love to see comment sections—in their current form—disappear completely, it doesn’t seem likely. People will always have opinions, and providing a public space to air them is an integral part of a transparent news organization. Both Scheufele and Ingram agree that the trick to making it work is to be vigilant, ensure accountability and, above all, to engage. Because no matter what new form comment sections take, there will always be a Penney waiting to fan the flames of uncivil discussion. I wonder if requiring commentators to use their real names might improve the tone. One of the threads in the article is about accountability, but anonymity means there are no consequences and no accountability, so people can – and do – say anything. I read comments, and there are cases where commentators have inside knowledge of the situation that they might not reveal if they had to sign the post, but I suspect that a lot of trolls would be discouraged for every legitimate poster. Spending time always in your computer without realizing that your pc is infected with malware and other viruses. Getting lag as you use it sometimes it hangs. Dude why not use fixmypcerror it safely Detect & Remove Adware, Malware, Spyware, Virus & more. I’ve been reading/posting comments at CBC for a number of years. Over the past couple of years, CBC’s made changes in an attempt to make those conversations more civilized. The most recent one was requiring readers to use their real names but it’s apparent many are using phony ones. Since last fall, there’s been a large increase in number of conservative partisan trolls posting lies, spin, insults, unfounded allegations — a most ugly tone that’s discouraging for the majority who desire that “civilized conversation” promised. More recently, those CPC partisan #s are increasing daily and I strongly suspect several of those identities belong to a small number of people. Having been a member of a number of discussion forums (and news website reader commenting) for several years, it’s looking more and more like a planned “takedown” of CBC commenting because “CBC is a Liberal mouthpiece”.